In Ngurumo village, Ntakira Location in Meru Eunice Ngoki is known as the queen of arrow-roots. Eunice is a member of Meru Jitegemee group, started to work with the Institute of Culture and Ecology (ICE) in 2008. After trainings on agro-ecological farming and need to revive indigenous seed and crops, Eunice decided to specialise on arrow-roots in addition to other crops that had disappeared in the community. There was a time that many believed that arrow roots could only be grown along river banks, but this was not the case for Eunice. With time, recognition of the health benefits of indigenous and traditional crops increased hence demand for these lost seeds rose. Eunice decided to specialise on the production of arrow-roots seeds in her community. Arrow-roots have not only been part of her family diet but source of income too. With a small portion of land (60*100m) Eunice makes approximately Kshs.1600 ($20) a week from the crop alone. 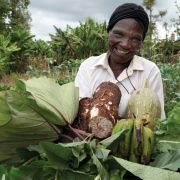 This inspired her to grow other varieties of indigenous and traditional crops and vegetables surrounding her house in a small portion of land. She has managed to feed her family with variety of nutritious foods from her farm and herself at her age she is still looking very hearty than most of women of her generation. She has endured the test of time, What is her secret? Indigenous foods! With her inspiring story, Eunice’s story tells that small holder farmers, through agro-ecology and their indigenous seed varieties can feed the world. Small scale farmers like Eunice are able to produce a variety of food crops using little. In addition, small scale farmers operations typically utilize more sustainable methods than conventional industrial methods to maintain soil productivity and control pests. The common features are: reduced chemical pesticide, mechanical cultivation, biological pest control and use of organic manure. Small scale farmers sell their produce to local market. This promotes local food crops as well as knowledge on local food crops production. Under food and community livelihoods programme in ICE, over 60% of the target beneficiaries are women. Through having the programme, their socio-economic status have been improved as a result of having enough and diversity foods to feed their families. This is because women are more affected than men by hunger and malnutrition. Therefore, in the international year of family farming, we must reiterate that there can be no food sovereignty without seed sovereignty! Protect our traditional seed varieties!